MGMT’s story should be well familiar now – two weird college kids inadvertently strike pop gold with their debut album, are poised to be superstars, but instead release two uncommercial records exploring the outer edges of psychedelic rock. 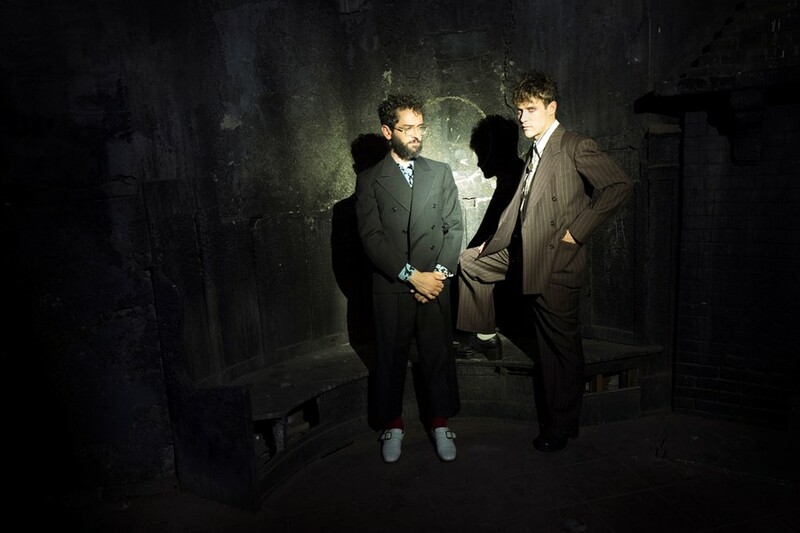 Their new album, Little Dark Age, is being described as the duo’s return from the wilderness to once again embrace the more mainstream sound they left behind. The assessment isn’t wrong, but it should probably be the other way around – Andrew VanWyngarden and Ben Goldwasser were always closer to psych rock provocateurs than pop superstars, and over the course of their weird, winding career, they arguably did more than any other contemporary band to make indie rock a stranger, trippier place. VanWyngarden and Goldwasser met at Wesleyan University in the early 2000s and connected instantly as genre-jumping, performance art agitators. Goldwasser played in bands ranging from blues to prog rock, while VanWyngarden was part of “an 80s monster ballads band, a Patsy Cline cover band, and a hip hop group,” as SPIN highlighted in an old profile. When the two worked together – under the name ‘The Management’ – they’d write absurdist tracks and perform them, karaoke-style, on campus alongside things like a 45-minute instrumental cover of the Ghostbusters theme. But the group developed a buzz on college campuses that led to major label interest and eventually scored a hat-trick of hits with “Time to Pretend”, “Kids”, and “Electric Feel” (all taken from their 2007 debut Oracular Spectacular), the kinds of ubiquitous anthems you could love, then hate, then love again in the span of a few weeks. Yet, almost as quickly as they rose to prominence, MGMT’s music took a left turn, sacrificing the broad success they seemed destined for a decade earlier. Their ensuing records, 2010’s Congratulations and 2013’s MGMT, reflected their eclectic tastes and love of psychedelic rock – they were perhaps the sort of records the band wanted to make in the first place, even if their newfound audience didn’t agree or totally know what to do with them. Perhaps thanks to the band’s earlier success, Congratulations performed well enough commercially, peaking at No. 2 in the States and No. 4 in Britain. But the album lacked singles with radio staying power, and by the time MGMT came around, both critical respect and commercial appeal appeared to be firmly dimmed, the album reaching a No. 14 peak in the US and No. 45 in the UK. After Oracular, MGMT toured non-stop for basically two years, riding the rise of festival culture to incredible cache. They also accrued their share of high-profile fans and would-be collaborators. Megastars like JAY-Z, Radiohead, and Rihanna, reached out about working together, but were ultimately turned down, as MGMT avoided becoming the go-to foil for stars looking to tie-dye up their aesthetic. While Congratulations aged better than its follow-up, MGMT, it’s hard to hear the band’s new album and not wonder what would have happened if they’d found this intermediary step earlier. Having watched them rebel against their pop success – something they addressed with deep discomfort on “Congratulations” – what’s encouraging about Little Dark Age is that it doesn’t feel like a desperate rehash of old tricks. Instead, it nods to Andrew VanWyngarden and Ben Goldwasser’s caravan of psychedelic influences (Spacemen 3, David Bowie, The Flaming Lips) but adds honest-to-God hooks. “When You Die” boasts sharper, more present vocals than anything since Oracular tracks like “Pieces of What”, while “Little Dark Age” offers the band’s best chorus in years, and the muted guitar riff is straight out of “Electric Feel”. VanWyngarden told Entertainment Weekly that the sessions for Little Dark Age were “a slightly more focused attempt to write more structured songs.” That’s quite the undersell, considering how soupy their previous two records really were in comparison. That Little Dark Age hasn’t had much chart impact shouldn’t come as a surprise. The indie rock ecosystem that MGMT are returning to is fundamentally different to the one they entered in the mid-2000s. At the same time, the music landscape is more amenable to the sort of sounds that MGMT always wanted to explore in the first place. Congratulations and MGMT don’t seem quite as uncommercial now that artists like Tame Impala, Portugal. The Man, and Mac DeMarco are visible in musical culture. Other genres have become more colourful and kaleidoscopic too, with singers and rappers experimenting with intergalactic guitar riffs, spacious vocals, and psychedelic synths. Kid Cudi, who collaborated with the duo on “Pursuit of Happiness” (which functions as something of a “Time to Pretend” sequel), made a pair of psych-adjacent records with 2012’s WZRD and 2015’s Speedin’ Bullet 2 Heaven, albeit mostly to critical derision. Miley Cyrus made a 23-track psych-pop record with the Flaming Lips and Ariel Pink, while last year, Jhené Aiko released Trip, a sprawling concept record about LSD that skewed spacy and psychedelic on tracks like “Jukai” and “Psilocybin (Love in Full Effect)”. While it would be reductive to attribute those artists’ forays into that world to MGMT, the band did help bring that sound and aesthetic back into the mainstream consciousness of a generation of headband-clad Coachella-goers, who seem to have taken to it in a more diluted form. In many ways, we’re in the post-MGMT world, which makes it a weirdly fitting time for them to be writing their catchiest, most accessible tracks in years. At the same time, the fact that few of the singles have really caught on may finally show they are today what they always wanted to be: post-mainstream. Maybe Little Dark Age will be seen as another messy, ironic-yet-earnest cosmic odyssey, but even if it is, the fact that we’re still talking about MGMT is proof of their enduring influence, and the fact that other bands have flourished in their DayGlo wake is a testament to their success bringing psych rock into the musical conversation – even if they had to commit to it so hard that it short-circuited their mainstream moment.